SilverLeaf Service on the Rocky Mountaineer offers guests a whole new train experience. 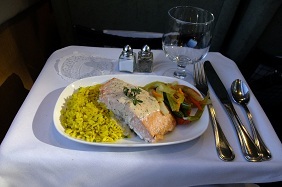 Located between RedLeaf and GoldLeaf Service on the comfort spectrum, SilverLeaf offers a single level dome car with hot breakfast and lunch each day and attentive service. SilverLeaf is available with all train trips between Vancouver and Banff or Vancouver and Calgary. 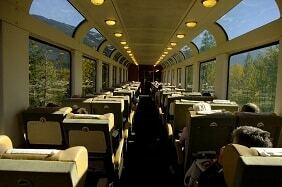 It is also available on all train trips between Banff and Vancouver or Seattle and Vancouver. In 2015, SilverLeaf Service will be available on Vancouver and Banff, Vancouver and Seattle and Vancouver and Jasper routes. SilverLeaf offers roomy, comfortable seating in luxurious single level dome cars. SilverLeaf Service gives you the opportunity to experience many of the amenities found in GoldLeaf Service at a significant savings. Speaking from experience, I can say, it’s a spectacular, bright, roomy, attentive experience that will leave you awed, content and satisfied. We look forward to putting you on the SilverLeaf Service. Available on two day rail journeys as well as packages of any duration. Take a look at the available dates above and then give us a call at 1-800-913-9207 or 604-990-9299 or Email.